Rumors, as they tend to do, go into overdrive when it comes to reality TV stars Chip and Joanna Gaines. 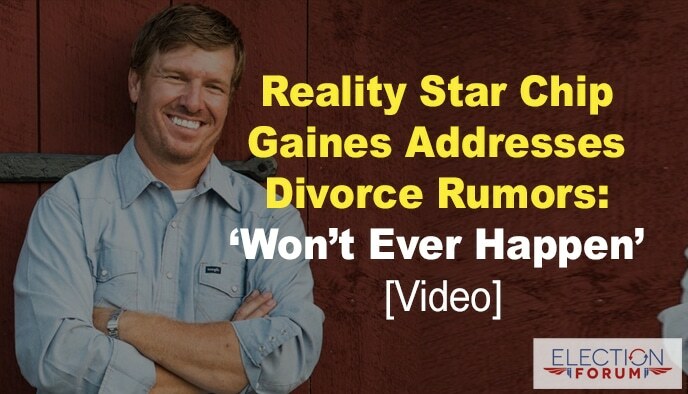 Is the famous couple behind HGTV’s “Fixer Upper” getting divorced? Chip Tweeted: Won’t ever happen … you can take that to the bank! According to the website I always recommend readers go to double check on the facts — Truthorfiction.com — there is no divorce pending. Seems that rumors began circulating once a fake news story appeared reading “Fixer Upper couple divorce: Are Chip and Joanna Finished? Fake news. It’s an intentionally misleading headline created by some website hungry for traffic. Incidentally, they came under attack by the progressive media. Meanwhile, some fans of the show are upset the Gaines are releasing its “Hearth and Hand” brand through Target, a chain often criticized for it’s liberal policies. One person Tweeted: “Very disappointed that as Christians you choose Target for your brand. Many Christians no longer shop there and my family still will not,” another tweeted. Target’s policy that “welcomes transgender team members and guests to use the restroom or fitting room facility that corresponds with their gender identity” has some people upset. The couple defends its decision, noting that a portion of the proceeds from sales will be earmarked for the Magnolia Foundation, a charity that helps families in need. Where do I fine Chip’s book?